Squares ABCD and MNOP are congruent with side length 10, and O is the center of ABCD. What is the area of the region covered by the union of these squares [First Steps, p. 81]. 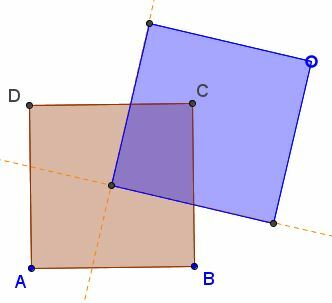 The main point to observe is that the area of the intersection of the two squares is exactly 1/4 that of ABCD. In fact (and hopefully the applet helps with this realization), the area of the intersection and even its shape does not depend on the size of the second (MNOP) square as long as it is big enough to include a corner of ABCD. The extended side lines ON and OP of MNOP cut ABCD into four equal regions the same for all M on a fixed line through O. 102 + 102 - 102/4 = 175. 102 + a2 - 102/4. where, after interchanging two equal right triangles, the intersection of the squares transforms into a clear quarter of ABCD. In [Trigg, #121] the same problem is given with an extra condition that one of the squares divides a side of the other in a ratio 1:2, which is of cause a red herring.